CAPE CANAVERAL, Fla. – Space Tango, Inc. launched an Anheuser-Busch research payload on December 15th at approximately 10:36 AM EST aboard a SpaceX Falcon 9 for NASA Commercial Resupply Services-13 (CRS-13) mission. Additional payloads from Zaiput and Biorasis, Inc., as well as two experiments from Space Tango, will yield data that could improve life on Earth. Anheuser-Busch, Zaiput, and Biorasis, Inc. each present a unique application and use of the microgravity environment to yield data that can be proven beneficial on Earth. In addition to working towards the goal of becoming the first beer brewed on Mars, Anheuser-Busch’s barley seed experimentation will provide valuable information on the production of barley for the agricultural community here on Earth. Similarly, Zaiput will be able explore the role of microgravity to further develop and refine their unique process of liquid-liquid extraction that relies on surface forces. Biorasis, Inc. will use the simplistic test environment provided by microgravity to help monitor the role of diffusion in glucose transport. This may allow Biorasis to improve the accuracy of medically implantable glucose biosensors (Glucowizzard™) and provide a more reliable product for the diabetic community. Among the commercial research flown on CRS-13, Space Tango will also be conducting experiments on Chaos carolinensis and E. coli to support future commercial research opportunities. 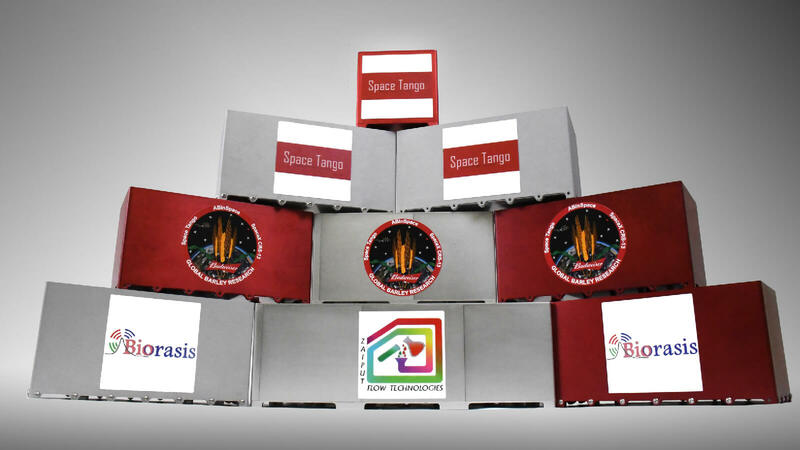 The SpaceX CRS-13 mission is Space Tango’s fourth customer flight to the International Space Station in 2017. Used across a variety of research areas, over two dozen CubeLab modules have flown to the International Space Station throughout this past year. The Germination of ABI Voyager Barley Seeds in Microgravity project is led by the Anheuser-Busch Company (St. Louis, MO). With the long-term goal of being the first beer brewed on Mars, this series of initial experiments – studying spaceflight environment effects on barley seed exposure, seed germination, and the malting process – will pave the way. This mission includes payloads to achieve two of three initial experimental phases: seed exposure and seed germination. The Evaluation of a Continuous Liquid-Liquid Separation Process based on Surface Tension in a Microgravity Environment project is a commercial venture led by Zaiput Flow Technologies (Cambridge, MA). While common immiscible liquid separation methods rely on liquid sedimentation, the Zaiput system has the unique characteristic of relying on surface forces to accomplish liquid-liquid extraction. By exploring the role of gravity (or lack thereof) on the process, the system can be further developed and refined for use in chemical production. Deconvolution of Biosensor Glucose Diffusion Contributions in MicrogravityThe Deconvolution of Biosensor Glucose Diffusion Contributions in Microgravity project is a commercial venture led by Biorasis, Inc. (Storrs/Mansfield, CT). The goal of the investigation is to improve the accuracy of medically implantable glucose biosensors (Glucowizzard™) for use primarily in day-to-day diabetes management. Microgravity will allow for a more simplistic test environment to monitor the role of diffusion in glucose transport and potentially improve the accuracy of the sensor – which may provide a more reliable product for the diabetic community. The Chaos carolinensis Behaivor and Locomotion in Microgravity is an internal experiment led by Space Tango, Inc. This payload will investigate the behavior and locomotion of a many-nucleated amoeboid – Chaos carolinensis – in a microgravity environment. Experimental outcomes could have terrestrial impacts on stem cell function, cytoskeletal alignment, regeneration, and cellular communication. The Evolution of Antibiotic Resistance of E. Coli is an internal experiment led by Space Tango, Inc. This payload will investigate the effects of microgravity on the evolution of E. coli resistance to antibiotics in increasing amounts. Via a 45° ampicillin gradient, mutant isolation and genetic evolution can be observed on an accelerated time scale. This may provide valuable insight into the damaging effects of the space environment on the immune system as well as the evolutionary mechanism of resistance in bacteria.